Ok so Mike Madden is the guy from the band that I was most looking forward to reading about. He's not like the other guys. He's never been one to hop from chick to chick like the others. He had his heart broken in high school, and he's not quite recovered. Even still, he never wanted to hook up with random people. He's wanted a relationship, commitment, from the beginning. So he spends his time playing video games instead of sleeping with strangers. I respect that. I mean...to me...that's hot. That's attractive. Not the guy who will sleep with anything that moves. So imagine how Mike feels when the girl who broke his heart shows up wanting a second chance. Hailey happens to be Danica's (Mike's high school sweetheart) cousin. Hailey grew up on a farm, whereas Danica grew up a spoiled princess. Where Hailey developed a love for animals and family, Danica developed a love for getting her way at whatever cost. These two couldn't be more different. Danica's only interest in Mike because his band, The Last Ones to Know, has recently signed a record contract and is blowing up. Yet Hailey comes to know Mike playing online video games together. They talk and she knows that Danica isn't worthy of his love. I read Havoc quickly and was impressed with the overall lack of physical scenes. The latter half of the book has a few scenes, but nothing like some of the previous books in the series. Language was still pretty present with f-bombs throughout the book. Sometimes I find that contemporary romance books have conflict that just makes me roll my eyes. This tends to be especially present in new adult books. And well that's kind of the case with Havoc. I felt like Hailey's issues were so simple. Had she been willing to have a conversation with her uncle up front might have prevented her from having a lot of stress. Also, I totally understand her struggle with the groupies that Mike's inundated with night after night while he's on tour. I would be the same way in real life I'm sure. But it was more of a struggle for me reading this book because I know that Mike's never been interested in groupies, and if he was going to seek them out he would have done it before getting into a serious relationship, not after. These conflicts and issues definitely left me rolling my eyes more than once. I still like Mike the best of the guys in the band, I think. But I don't know that this was my favorite story in the series or not. 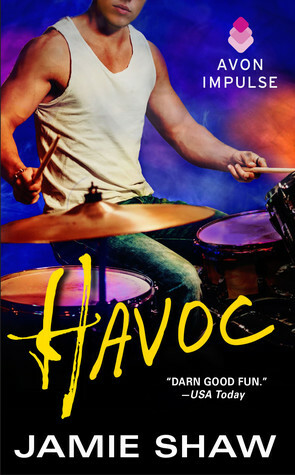 Issues and all, I read Havoc really quickly and I'd give it 3.5 Stars. Have you read Havoc? What did you think? Let me know!